George Graham Reviews Ma, Duncan. Meyer and Thile's "The Goat Rodeo Sessions"
Years ago, it used to be something of an anomaly when musicians of very different genres would collaborate. For much of the 20th Century there was a rather steep divide between classical music and jazz, and later rock. Over the years, there have been some notable recordings that brought artists from different musical worlds together, which often came across as more of a musical novelty whose main impact was the fact that the disparate players were working together, often doing a hybrid of styles, rather than a real collaboration in making new music especially for the occasion. In past decades, one can think of Benny Goodman playing classical music, and numerous rock bands working with orchestras, essentially playing orchestral arrangements of the band's tunes. But in recent years, true cross-genre collaborations have been becoming more common, as many of the musicians themselves have been exposed for most of their lives to other styles. It's rather common these days for musicians studying in classical conservatories to have a rock or jazz band on the side. This week we have a particularly fine example of musicians from different worlds not just playing together but creating music for the occasion. It's a joint album by arguably today's best-known classical cellist, Yo-Yo Ma, with eclectic bassist Edgar Meyer who had made a career of easily moving among classical music, jazz and bluegrass; ubiquitous Nashville fiddle player Stuart Duncan; and mandolinist Chris Thile, co-founder of Nickel Creek, the highly innovative bluegrass band, and the equally eclectic acoustic group The Punch Brothers. This is not the first time that Yo-Yo Ma has worked with Edgar Meyer. They collaborated on a CD in 1996 called Appalachian Waltz, and in 2000 on Appalachian Journey, which both featured another genre-jumping musician, violinist/fiddler Mark O'Connor. Yo-Yo Ma wanted to do another collaboration with Meyer, so Meyer brought in Chris Thile, a bluegrass prodigy who has risen to one of the major figures on mandolin. They suggested adding another player, Stuart Duncan, a first-call studio musician in Nashville who has recorded with Dolly Parton and Reba McEntire, and was a founder of the traditional-style bluegrass group the Nashville Bluegrass Band. Duncan also happened to have played on Thile's first album, made when Thile was all of 12-years old. The four diverse musicians soon hit it off well musically and personally. They decided that the music would be all-original, created around the players. As it turned out, Thile, Meyer and Duncan did all the writing. The pieces took into the consideration that Yo-Yo Ma felt he did not have the confidence in improvising, and Stuart Duncan was similarly inexperienced at reading musical scores. They also wanted to have a couple of vocals to break it up sonically, so Aoife O'Donovan of the group Crooked Still was brought in for a couple of track to sing duets with Thile. They met in Massachusetts and settled in at James Taylor's recording studio in the Berkshires and worked on the music, usually playing together in tight physical proximity. The result is exceptional: four virtuosic string players paying no attention to style boundaries, and creating music that is both wonderfully eclectic, and imbued with the sense of camaraderie and outright fun that these remarkable players were obviously having. Most of the time, it's a kind of altered string quartet with violin, mandolin, cello and double bass. But most of the bluegrass guys are multi-instrumentalists, so there some tracks feature banjo, on one Thile switches to another fiddle, and on a couple of tracks, Meyer significantly alters the texture by playing piano. The influences range from hints of contemporary classical to old-time Appalachian to jazz to Celtic. And in keeping with Yo-Yo Ma's reticence to improvise, there are no jams to speak of on the CD, but interesting, multifaceted composition that often go through shifts of mood and sonic color. One can hear the influence Chris Thile on a number of the pieces, in the interesting, complex arrangements in the style of his band the Punch Brothers. The liner notes of the CD point out that a "goat rodeo" is defined in a dictionary of slang to mean a "situation that order cannot be brought to at any time." 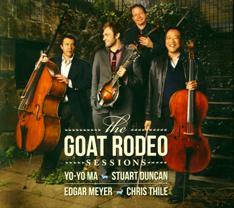 The new CD The Goat Rodeo Sessions by Yo-Yo Mo, Stuart Duncan, Edgar Meyer and Chris Thile certainly has the musical eclecticism running freely, but chaos it's not, and it would be hard to find four guys who have better control of their instruments. The playing is spectacular, and the music they created for this project is thoroughly interesting, often taking unexpected turns, and always conveying the kind of mutual musical admiration that is evident in this stellar group. I'll also give this one of my rare grade "A's" for sound quality. The CD was released on Sony Records' classical division, Masterworks, and as such, it was recorded and mastered more like a classical album without significant volume compression. The sound is very clean and transparent, it's so refreshing to hear a recording in which the dynamics of the performance are preserved. This is not the first time that classical and bluegrass artists have collaborated. In fact, Yo-Yo Ma did two or three previous such projects with Edgar Meyer, but The Goat Rodeo Sessions definitely stands out.